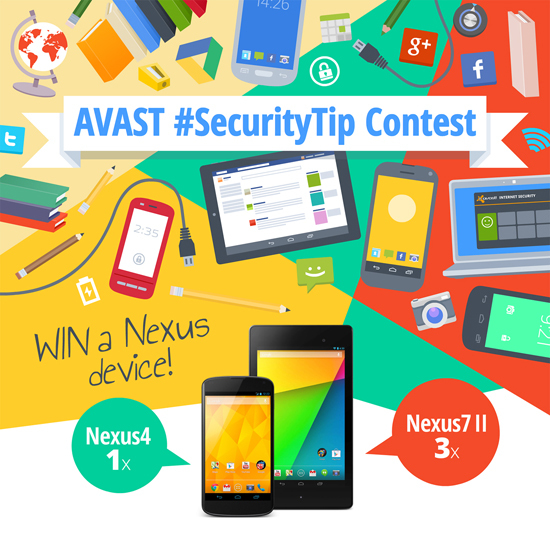 Write a #SecurityTip and Win a Nexus Device! The AVAST #SecurityTip contest has begun, and everyone is invited to participate. It's easy! Just write a security tip that we can share with other computer and mobile users and you'll get the chance to win a Nexus device or a free 1-year license for avast! Internet Security! Each week in September, we will ask you a question related to our security topic of the week, and you could win a Nexus 4 smartphone or a Nexus 7 tablet just for sharing your knowledge and know-how! Our favorite tips will win one of four Nexus device. One-year licenses for avast! Mobile Premium and avast! Internet Security are also up for grabs for the most popular tips. The way to win is to write a helpful tip for computer or mobile users of all levels. You can also win by asking your friends to vote for your tip. 4. Write a #SecurityTip that will help AVAST users keep their devices and personal information safe and secure wherever they are. Use the hashtag #SecurityTip in your tip. Once a week for the next 4 weeks, one author of an outstanding #SecurityTip will be selected by the Social Media team to be awarded a new Nexus device. Each Monday we will announce the winners, and we will ask you a new question related to security or privacy. Write a new #SecurityTip, vote for your favorites, and invite a friend!